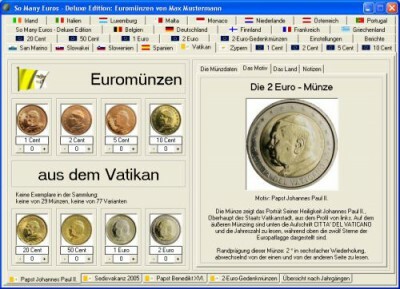 So Many Euros - Deluxe Edition is a program for Euro coin collectors. So Many Euros - Deluxe Edition is a program for Euro coin collectors and helps you to keep track of your collection. Pictures of all 264 Euro coins and the new 2 Euro commemorative coins will support you while trying to identify a given coin. For every coin there is information available about the motive and the number of copies. Using the extensive reporting function "Search" and "Offer" lists (text or HTML) can be created. So Many Euros is a digital collector�s box for your Euro coins.